(Wild Sarsaparilla (Aralia nudicaulis) - 15) When clustered together, as in this photo, wild sarsaparilla are hard to identify individually, but because of their unique appearance, they are relatively easy to distinguish from other plants growing in the woods. 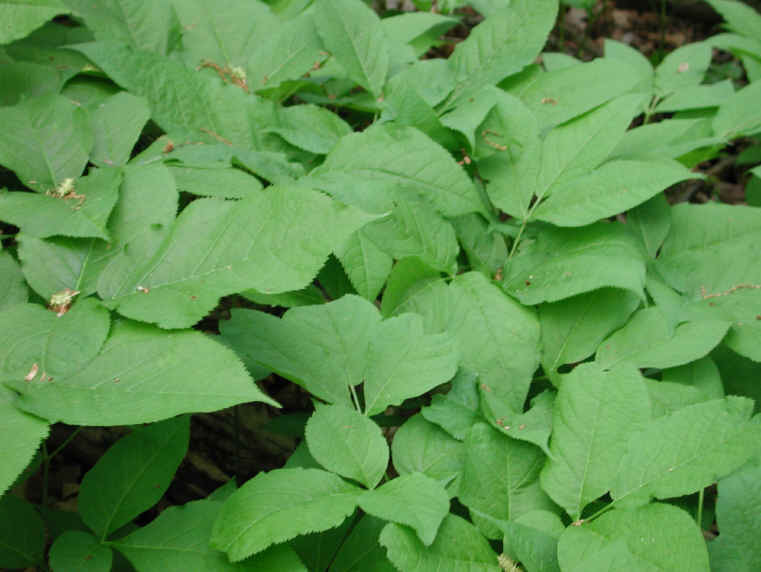 Wild sarsaparilla are members of the Ginseng (Araliaceae) family, which is the reason for the scientific name, Aralia. The other part of the scientific name, nudicaulis, comes from the Latin nudus, meaning "bare" or naked", and the Greek kaulos, meaning "stem" or "bare stem".